We haven’t had a chance to taste it, but don’t put it past us. 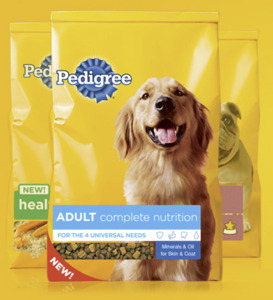 Pedigree, created its new dog food formulation on recommendations out of the Waltham® Centre for Pet Nutrition, which identified four Universal Needs of Dogs: healthy skin/coat, preventative oral care, good digestion, and a strong immune system. In other words, when your pup receives the nutrition he needs to fuel these four areas, and you have the foundation for a happy, healthy pet. Makes sense to us. Like with humans, skin is your dog’s largest organ – essential to everything from protecting her from bacteria and viruses to regulating her core temperature. So, Pedigree’s added zinc and linoleic acid for a healthy coat and dermis. And oral care, often overlooked by pet owners, is the best protection against periodontal disease. Eighty percent of adult dogs will suffer from this painful condition; potentially worse, periodontal disease can lead to serious heart, lung, and kidney problems. As for healthy digestion and a strong immune system, those are no-brainers. Gastrointestinal troubles are no fun (for either of you), so Pedigree’s new formula includes increased levels of fiber – essential for bacteria control, nutrient absorption, and even weight management. Vitamins C and E, antioxidants, were incorporated to boost immunity. Pedigree’s new line hit stores last month, and the results of taste tests from our four-legged reviewers will be in shortly. Meanwhile, we applaud Pedigree’s commitment to ensuring all dogs receive loving homes – and high-quality dog food. If you would like to read more about Pedigree’s new line, head on over the Pedigree.com.